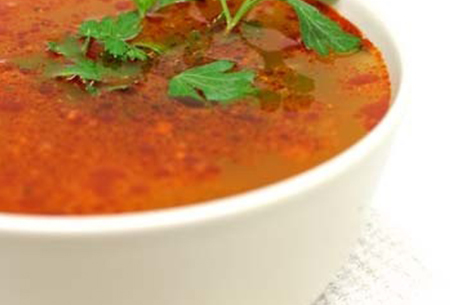 This is such a beautiful soup – simple to make and can be served hot or cold. To prepare the tomatoes -Place whole Roma tomatoes into a large bowl and cover with boiling water. Soak for a few minutes and then gently pierce the skin of each tomato. Continue soaking – if skin is not loosening and peeling back, add more boiling water. When you can gently peel all the skin off the tomatoes do so and then chop them and place aside. In a medium saucepan add carrots, tomatoes, powdered coriander, stock powder and boiling water to almost cover vegetables. Bring to the boil and reduce to a simmer. Cook for 30 minutes or until all the vegetables are really soft – add chopped fresh coriander and return to heat for another 5 minutes. Remove the bay leaves and then blend or bamix with soup. Serve and add cracked pepper.